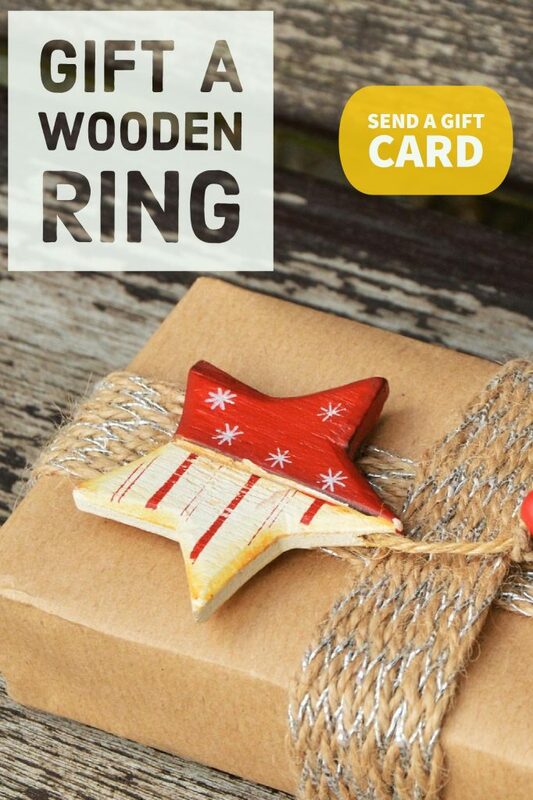 For a person or couple who is eco-friendly and would like a natural, hand-crafted wooden ring – gift them a Wooden Ring Store voucher and they will be able to experience the creative process of designing their own ring. We will send the voucher to your loved one via email immediately or on the date that you specify (such as on Christmas day or a birthday). The voucher is valid for a year, giving them plenty of time to select. They can choose from our variety of beautiful woods, which range from silver greys to golden honey tone, or dark ebony. Picking any design on our website, or working with us to custom design a ring. But most importantly, they can select their exact size. This way you can give them a ring you know they will wear. We make our all or our rings using bent wood technique, which makes them very sturdy. The rings are made with an environmentally conscious ethos, since wood and materials we use are natural and renewable. Most of our wood for our rings are from leftover cuts of wooden furniture that would otherwise be discarded. Our workshop runs on renewable solar energy. Simply click here and buy the gift card. Gift the right wooden ring but still keep it a surprise. It will be emailed to the nominated email address with a message from you. Not sure about the gift card? Don’t forget you have the option of engraving the ring to make it that much more personal. If you are still a bit hesitant and aren’t quite sure which ring to pick for the perfect gift, please contact us, and we will help you.